Dan is a fulltime cartoonist and has published his cartoons in magazines, newsletters, newspapers, print advertisements, posters, calendars, books, apparel and giftware, greeting cards and many other professional print platforms. A lot of online publishers use his work including his daily web cartoon on blogs and websites around the globe. Dan’s cartoons also appear on many professional Facebook pages. 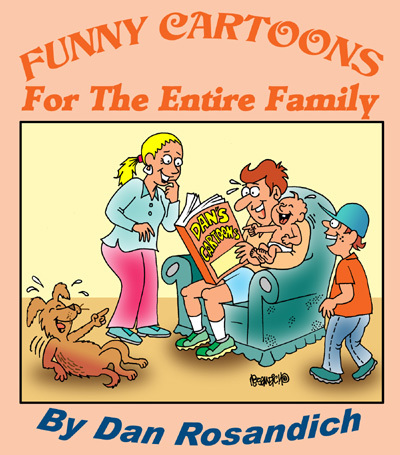 Funny Cartoons For The Entire Family is an Ebook collection that showcases 194 of my favorite cartoons. A majority are in full color and the book showcases two cartoons per page. You get a variety of humorous single panel gag cartoons and the collection also acts as an additional portfolio which showcases my work. Signing up for ToonBlog alerts you to new cartoons that are added to the site and alerts subscribers to any new projects or cartoon related news, information or thoughts I might have in regards to the world of cartoons.